Find all the gear you need for a fantastic fishing trip at the Old Fishing Store! Walk up the steps from the beach into the shop selling fishing rods, hooks, harpoons, diving equipment, oxygen tanks and much more. Climb the ladder to the top of the watchtower and look through the telescope to enjoy the view. Then relax and read the newspaper in the office. Just make sure the cat or seagulls don't eat the freshly caught fish hanging outside! This comes down to 9.71 cent per brick. The Old Fishing Store (21310) Lego set is no longer directly available from the sites below. However, 3rd party partners of these sites might still have the set available. Alternate description Prepare for the ultimate fishing trip! 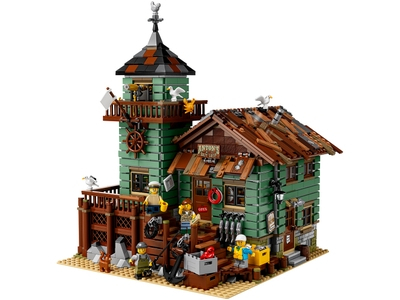 Old Fishing Store features a detailed exterior, shop and connected lookout tower with office, all standing on a sand-colored LEGO® 32x32 baseplate with rock-style elements.